Homebase are one of the major DIY retailers in the UK and with well over 300 stores nationwide they are certainly one of the big names when it comes to all things home improvement. Homebase, though, are also a fantastic garden retailer. Their site has a large and quite impressive garden section and many of their stores do have dedicated garden centres. Sheds, playhouses, log stores, summerhouses and everything in between is available from Homebase. If you can place it in your garden and sit inside in or store things inside it, then chances are, Homebase are going to sell it. As Homebase have so many products, we totally get that some of you will go on the hunt for a Homebase voucher code so that you can get a little bit of money off that dream shed, summerhouse or playhouse for your child’s birthday. We really like the vast amount of products that are available at Homebase and with this guide we are going to try our very best to make sure that you get the best deal possible, but also ensure you do not waste your time with these sites that promise the best Homebase deals only to let you down. We know that if you have come to this page you are looking for a discount code for Homebase, as we explain further up Homebase dont often issue discount code. As such we thought you might like to see what are some of the best discounts that are currently on offer from other garden building retailers. The 5 tips that 90% of people who SAVE money at HomeBase use! Because Homebase are such a large nationwide chain there are always going to be a lot of sites that are offering various Homebase voucher codes and deals. Most of the time, these are not special offers at all and just deals that you can get direct through Homebase. Sometimes they even use old and expired Homebase deals to try and tempt you to their site. The whole thing can be a royal pain in the rear end. Well, here at WhatShed we feel your pain and that is why we are only going to list deals and tips that we know actually work. If you really want to make sure that you are getting the best deal possible, then we think you are going to love the Homebase deals that we have listed below. Save money on their fantastic wooden sale: No Homebase voucher code is needed for this fantastic deal, so do not be fooled by one of these money saving sites making it seem like this deal is exclusive to them. This is a deal that sees you get a very impressive 15% off a variety of sheds, summerhouses and playhouses that are made from wood. Getting a discount this large is quite unusual, but when it does happen, you better believe that here at WhatShed we get very excited about it. If you are in the market for a wooden shed, playhouse or summerhouse, then this is something you have to look at. Okay, so we have gotten giddy over this deal like a schoolgirl at a whatever the popular boyband of the moment is concert. But one thing we must tell you about this incredible deal is that this will not be forever. The reason though that we have put it here is that there is always some kind of Homebase deal going on and this one right now just so happens to be it. The fact that they are giving such a huge discount though certainly gets them two thumbs up from us. There is always some kind of deal in the Homebase garden section: This tip really ties into the one we just talked about. You see, Homebase sell a ton of different things, but they do a great job in keeping things in their own sections. For example, they have a very impressive garden section where you will find all their sheds, greenhouses and other garden structures. When you go to this part of the site, you will see right away what their latest deals are. There are usually two or three deals running at any one time. For example, as of us writing this guide, there is the deal we just talked about where you get 15% off various wooden structures, but they are also having discounts on garden equipment and garden cleaning equipment. These Homebase deals do change from time to time, so be sure to keep on checking back to see if they have any crazy offers that suit you. They have special offers listed on their Facebook page: Many garden retailers have their own Facebook page. Actually we know a few people who for some reason even give their cats their own Facebook page, so it is like everyone and everything has a Facebook presence these days. But if you do look at this one here then you can come across some great Homebase deals and if there is on a rare occasion a genuine Homebase voucher code then it will be posted here. We will say that they do have a lot of informative type of posts on their Facebook page, but if you do a little searching then you will notice that they do let you know when they have some kind of sale going on. Use their newsletter to keep informed on their current deals: Here at WhatShed we are sometimes a little apprehensive about suggesting people sign up for a newsletter. Especially when it is for a retailer who offers such a vast amount of different items as Homebase does. You are looking for a shed so the last thing you want is your inbox bombarded with deals about kitchens. Well actually Homebase have a newsletter that is very smartly organised. You see when you sign up for it, you can actually specify what kind of Homebase deals you want to be informed about. So you can just tick the garden boxes to ensure that, you get all the latest deals and offers that they have. We really like this and feel that it is a way many other retailers should operate their newsletters. They post deals and offers on their official Twitter page: Okay, so let us start by saying that most of what you get on the Homebase Facebook page will be posted here. But also like their Facebook page, you can find out about all kinds of great Homebase deals on their Twitter page and while you will have to go through the page to find their best offers. We feel that it is worth having a look as it can save you some money. Above all else, if there is a Homebase voucher code, Homebase special offer or just a great deal in general, then it is going to be posted here long before one of these money saving sites. A round-up of all the current Homebase voucher codes we found online. Homebase is a retailer that we like and we want to make sure that when you guys purchase a shed, summerhouse or whatever it is you are in the market for, that your experience is as painless as possible. That is why we make sure we give you the right info on products, retailers and now we are taking a close look at money saving sites who do nothing more than get your hopes up and waste your time. Everyone wants to get the best deal possible and sadly there are some sites who will take advantage of this by wasting your time with old deals and offers, as well as Homebase voucher codes that just do not work. We have put together this list of money saving and voucher code sites based on what are the most popular searches on Google. We used search terms that are very common such as: Homebase Voucher Codes, Homebase Coupon code, Homebase Current Discounts, Homebase Current Voucher Codes and Homebase Sale. Do Not Be Fooled By Old Deals And Codes! Many of these sites will beef up their Homebase voucher codes and deals section by keeping Homebase deals that are long expired. We know that you want to save money, but please try not to be tempted by these types of deals as they will not save you any money at all. What they claim? VoucherCodes.co.uk are one of the biggest sites on this list and they have a section that is dedicated to having Homebase voucher codes for 2016. When you take a closer look, you actually realise that these deals are supposedly current for whatever month it is you are looking at their site. So they do a good job in making you feel like you are only getting the most recent deals on their site. What We Found? This site has a major problem that pretty much all the sites of this list claiming to offer Homebase deals has. This problem is that Homebase sells so many different items, that it is all just jumbled together. They have a couple of generic Homebase coupons at the top, but after this it is just a free for all of Homebase offers. They have the same 15% discount on wooden sheds that is listed on the actual Homebase site, but it is sandwiched in between a deal for a tub of emulsion and money off a bathroom suite. The time and effort it would take you to find a deal that you can just already get on the Homebase site is not worth it at all. What they claim? This site claims that if you use their Homebase voucher codes that you will be able to keep the cost down when it comes to doing some DIY. This we know is going to be very tempting for some people. They also claim that their Homebase offers are active and current. They do give you a little background information about Homebase as well, but to be honest with you it comes across as a way for them to just have more text on their page. What We Found? They do have a decent amount of Homebase deals listed on this site. They actually have 14 of them, but we found only one was any good for those of you looking to spruce up the garden. Now this is actually a valid deal, as it is the one that gives you money off their wooden sheds, summerhouses and playhouses. The problem we have with it, is that you get this deal right from Homebase themselves so coming here is nothing more than a waste of your time. Especially when you have to pick out this deal from a bunch of random ones about wall paper, bathrooms and kitchens. What they claim? Groupon claim to have an impressive 26 different Homebase voucher codes. When you look at their long list of Homebase deals, you notice that they are claiming that these are all sales and that you can get some pretty big savings by clicking on them. One thing that they do, which we do not like, is that they make it seem like some of these Homebase sales and deals are just for them when you can get them direct from Homebase and some of these other sites as well. What We Found? Once we had looked through all 26 different Homebase voucher codes, we noticed that only a couple of these were actually for garden items and even then, you are not getting a deal here that you cannot get straight from Homebase themselves. Annoyingly, some of these so called sales are quite misleading. For example, one that piqued our interest was the ‘Home And Garden Sale’ deal that they had, but when we clicked on it, instead of being taken to a page full of deals, we were just taken to the Homebase homepage. What they claim? The Mirror, yes The Mirror. We were as surprised as you are that they have a section that offers Homebase deals, but there it is. Anyway, The Mirror are trying to give you all this information about saving money at Homebase and even suggest a few links, but as you have probably expected there are no specific garden structure deals here. What We Found? To be fair to them, The Mirror is one of the least offensive sites on this list. They do actually try to give you some information about how to get a good Homebase deal, but the problem is, most people who visit this site will be wondering what the heck is going on as you are bombarded with links to other things. The site even has a video playing which if you have the speakers on can be very annoying. Plus, they do only show a couple of the current Homebase deals here and neither of them will save you any money on that dream shed of yours. What they claim? UKPromoPro perhaps have a large amount of different Homebase deals on their site. They do actually claim that all the Homebase voucher codes and other deals that they have are valid and depending on what month you visit their site that is the month they will say they are valid for. What We Found? We found a vast amount of Homebase offers here. There are right around 40 different Homebase deals listed and there is no rhyme or reason to the way they are organised, so you have to look through them all to find the ones that will save you money on a shed or some other kind of garden structure. The problem we have is that when you do find a deal that is for a shed, it is the same one that Homebase have on their homepage. So you really are just wasting your time by looking through all the deals, as you will be no financially better off for it. Also, their expired Homebase voucher codes section really bugs us as they claim that they might still work. Which is just a sneaky way to get people to click on their links. What they claim? On the VoucherBin site, they claim to have up to date Homebase discount codes for 2016. They also try to get you to bookmark their page as they claim that these deals do not last long which is actually true, but we still do not think there is actually any need at all to bookmark their page. What We Found? We found that they only had a couple of garden related Homebase deals and even then they were just links to the Homebase site and not to any special kind of deal. Also, considering they were claiming to have up to date Homebase deals, when we clicked on their deal to get 15% off a greenhouse, we were taken to the greenhouse section, but there was no such deal. They either have not updated this offer, or they have just not done their homework properly. MoneySuperMarket.com – Over 300 expired Homebase deals! What they claim? MoneySuperMarket.com is actually a site that we do not mind. But their Homebase section really does need some serious work. They do claim that they are up to date and that you should keep checking back and sign up for their newsletter to get the latest deals. What We Found? Out of all the valid Homebase deals, only one of them was for a shed. This was the same 15% off that is found everywhere. So this does show that they try to keep up to date at least. The worst thing about this site though, is their expired codes. They have well over 300 of them still listed on their site. Now they do say that these are expired, but we can just imagine the poor person clicking through all these looking to save a little bit of money. We really wish sites like this would just delete these old deals. MoneySavingExpert.com – They really want you to sign up for their newsletter! What they claim? This is a site that really wants to give you a lot of information about saving money. The one thing that you will really notice about this website is that they really want you to sign up for their newsletter. If you do this, they claim that you will get the latest deals, guides and loopholes, but we assume this is just a general email that will not relate to Homebase or saving you money on a shed or summerhouse. What We Found? A whole lot of text that is what we found. Now to be fair to them, they are at least trying to tell you about the various Homebase deals in an informative way, but being constantly asked to sign up to their newsletter gets a bit annoying after a while. 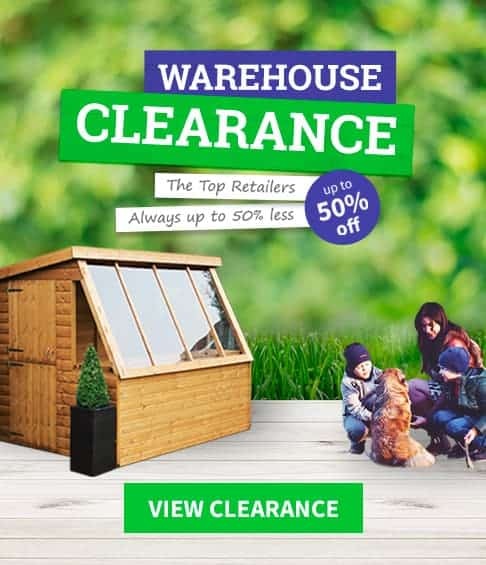 Also, the deals here that they have at the moment do not include the current Homebase sale that has money off sheds, summerhouses and playhouses, so they clearly do not list every deal that is currently going on at Homebase. They also have one of our biggest pet peeves and that is still having expired deals on the site. What they claim? 360VoucherCodes.co.uk are claiming to have up to date Homebase voucher codes that are going to give you instant savings. On this site, they do actually have a mixture of Homebase discount codes along with Homebase deals as well. They claim to update on a regular basis and even give you the date of when the last time they updated was. What We Found? The first part of their site has their Homebase voucher codes, of which none of them were actually for any sheds, greenhouses or anything like that. After this, they do have a Homebase deals section and here you will find deals for all kinds of things that Homebase sell. But despite claiming to be up to date, we did not see the current deal that Homebase have on their site for sheds. Out of curiosity we did click on a few of their deals, even though they were not for garden structures. While some did take you to a specific section of the Homebase site, others just took you to the homepage. What they claim? What we have here is a site that claim to update their Homebase voucher codes daily. They have a large section dedicated to Homebase, which at first glance may make many people feel like they have found a place that is going to have a lot of Homebase deals. One other thing that this site does and it is something we do not like, is have other deals listed that may interest you. Most of these have nothing to do with Homebase, sheds, greenhouses, summerhouses, or anything else that you would want when looking for a shed. What We Found? We found a rather decent amount of Homebase deals listed on this site. But much like the other sites, these are for all kinds of random things that Homebase sell and there is no way to filter them so you only see the ones related to garden products. As well as this, they have Homebase voucher codes that have been expired for a while still listed on the site. This is something we really do not like and to make it worse, they try to tempt you into using them by saying that they might still work! We are certain that they will not and trying them out is just a huge waste of your time. How about having a look at voucher.ninja – It’s never failed me so far?